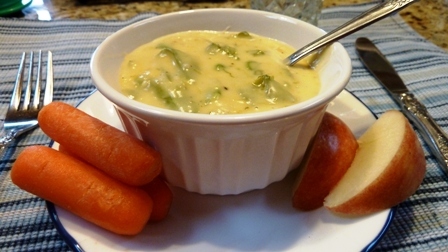 Cheesy Snow Pea Soup, Mennonite cooking, recipe, Whatever Happened to Dinner? But one Saturday last winter when the hub was working and I was alone for lunch, I cooked up my very own invention, Snow Pea Soup, using the same kind of base I would use for a broccoli-cheddar soup, and it was yum. 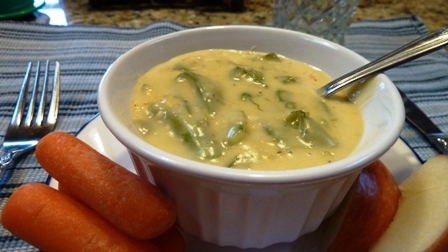 Not quite as good as actual broccoli soup (one of my all time favorites) but good enough if you want something different and have snow peas to use up, like I do. Most other snow pea soup recipes I found online went in an Asian direction but that wasn’t what I had in mind. 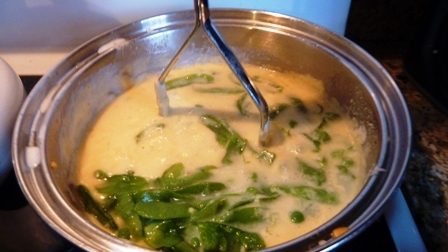 Another used creamed or blended snow peas for more of a split pea and ham type soup. See what you think! So if you like experimenting on small quantities for just yourself, or want a simple “girls lunch” for two, check this out. In saucepan, melt butter. Blend in flour and salt. 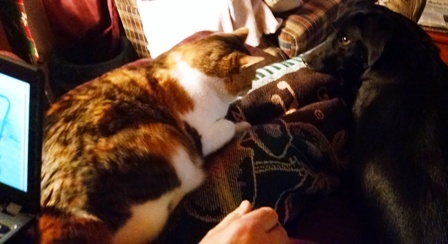 Gradually heat, stirring in milk. Stir frequently, and keep stirring as sauce thickens and becomes smooth. Add cheese, stirring, (it can scorch easily). Add cooked snow peas. Heat through and serve. Serves one or two. You can always add more veggies for extra nutrition and flavor: bits of chopped onion (sautéed or just added in), chopped carrots, cauliflower, chopped potatoes (all of these cooked before you add them), more cheese, different cheeses, as desired. What’s a favorite soup for you? Do you like soup year-round or mainly in the winter? Improvements to suggest for this? I’m all ears. Or perhaps I should say tummy! You can find my book with many more recipes (almost 100) and inspiration for keeping family meal time at the MennoMedia store. Speaking of this online store, there are FANTASTIC DISCOUNTS going on right now, some ending May 31, some ending later, but as much as 70% off! You can get Simply in Season for $6.99 until May 24, 2015 (two more days). Inventory is coming up, so we’re cleaning shelves. (Yup, I get to help do inventory.) Of course, a beautiful photo-filled edition of Simply in Season is coming out next week, so, be warned. And THAT one is on pre-publication discount for just $18.74 until May 25. Coming back from my Pilates class, I ate a bowl of garden peas and a slice of “Amish country” Colby cheese and then I saw your post. Wow, synchronicity at work again. I like soup mainly in the winter, but it’s a quick filler any day. My favorite soup? Probably tomato basil, but my son-in-law makes a mean butternut squash soup recipe. I love snow peas too and even like to eat them raw. I’m sure the plain slice of Colby cheese and plain garden peas was appropriately healthy for your after-Pilates relaxation! If I lived in Florida I probably wouldn’t crave soup quite so much. I made butternut squash soup once (it’s ok, but a lot of work!) and now I have my first basil plants growing in the garden from seed, so I’m excited to try all things tomato-y + basil this summer. I agree that snow peas are great raw. Thanks for checking in! We just eat our sugar peas raw or in a stir fry. Soup is a cool/cold weather food to me. Don’t eat it ever if it is warm out. We’re finishing a kettle of turkey-wild rice soup I made last week on a particularly cold day. I’d frozen up the carcass so cooked that up and added lots of carrots, onion, celery and potatoes. Tues and Weds night we had a frost/freeze warning which fortunately did not materialize. My favorite soup I make is a recipe we grew up with. It’s minestrone…navy bean, carrots, celery, onion, cabbage, potatoes, rice, peas, tomato. But it’s really thick, not like the watery stuff you get at a restaurant like Olive Garden for example. Whenever I make soup I put several extra quarts in the freezer. I do have a liking for Campbell’s tomato soup and always keep that on the shelf. We like to add leftover rice to it. I think my favorite way is in a stir fry. Both your turkey-wild rice soup and the miniestrone sounds great–nice and thick. So smart to freeze soup for a busy day. We had about 45 degrees this morning so that’s plenty chilly for Memorial Day weekend; glad we’re not camping like some of the family. Have a good weekend!